Gabby Logan is a famous British Presenter and former Welsh International Gymnast. Being the child of a very popular footballer, she had all she could ever want as a child but that didn’t stop her from chasing her dreams. Actually, it helped fuel her desire for sports and sports-related activities even more. Sadly though, she had to quit gymnastics at a very young age due to health issues but her love for sports never waned. After College, she decided to pursue her career as a presenter, she gave it all she had and the rest, as they say, is history. Below is all you need to know about Gabby Logan, her early life, husband, and several other facts. Bio – Who Is Gabby Logan? Gabrielle Nicole Logan Nee Torah was born on the 24th of April 1973 in West Riding Yorkshire, Leeds to her parents – Terry Yorath and Christine Yorath. She is the first of three children by her parents, the others being – Daniel Yorath and Jordan Yorath. Her dad was a former professional footballer and manager and as a result of that, she was subject to moving around as her father was known to play for several British teams which include: Leeds United, Coventry City, Tottenham Hotspur, Bradford city, Swansea city, and the Welsh National team. Growing up, she had her elementary education at Bishop Ullathorne RC School in Coventry, England. During her high school days at Cardinal Herman High School, she was known to be very good at gymnastics, to the point of representing Wales at the 1990 commonwealth games which held in Auckland. She eventually quit gymnastics at 17 due to sciatica. Upon graduation from high school, she attended Durham University where she obtained her LLB in law. Shortly after graduating from the University, she found a job as a presenter for Metro FM in 1992. In 1996 she was offered a job by Sky Sports and worked at the network for two years. Her big break came in 1998 when she joined television Giants ITV. At ITV she expanded her repertoire by getting highly involved in the presentation of several football fixtures such as the world cup and the UEFA Champion’s league games. On the 27th of January 2007, she was employed by BBC Sports and charged with the responsibility of presenting coverage on FA Cup matches. In 2011, as a result of her hard work, she was given the rare privilege of hosting her own show which she called the Gabby Logan Show, it aired during weekdays by 9 PM. Ever since her own show kicked off in 2011, she has been on the constant rise, earning a reputation for presenting and hosting hit shows for several television networks such as Live With Gabby show on Chanel 5, I love my country for BBC 1, Splash on ITV and Sport Relief to name but a few. In 2015, she took a step further by becoming a columnist for the Times, the Guardian and several other style magazines. She is also a four-time recipient of the Sports Presenter of the Year award at the Television and Radio Industries Club Awards and also a proud winner of the Tesla Mum of the Year award in March 2012. 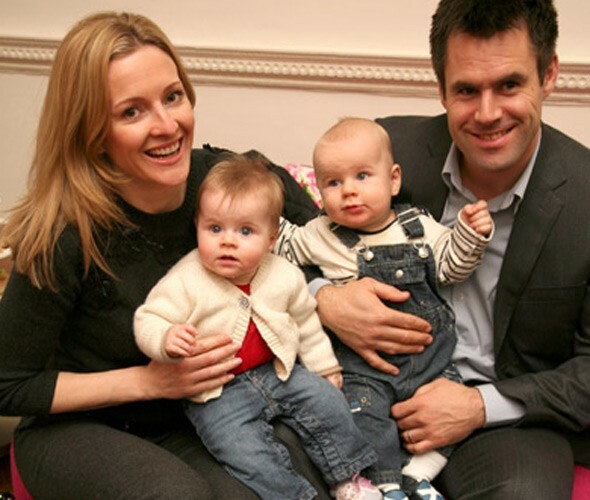 Kenny Logan is a retired Scottish international rugby player and also husband to the beautiful TV presenter Gabby Logan. He was born on the 3rd of April 1972 in Stirling, Scotland. Not much is known about the early life of Kenny Logan except the fact that he attended Wallace High School but quit school few weeks to his final exams in order to pursue his career at rugby. At age 17 he made his professional rugby debut for his home town team Stirling County before joining Glasgow district in 1996. Since then, he has gone on to become one of the most decorated Scottish rugby players of all time with him winning three English rugby championships with Warps and one with Stirling County. On the 19th of July 2001, Kenny got married to Gabby Yorath. Although there is little information on how they met, Kenny once revealed that at the start of their relationship Gabby’s father didn’t seem to like the idea of him with his daughter but after a while, he found out how much of a nice guy he was and then gave his blessings. After their marriage, Gabby adopted Kenny’s last name – Logan. 1. They are parents to a beautiful set of twins – a boy named Reuben and a girl called Lois. They were birthed on the 25th of July 2005 by Gabby through IVF treatment. She recalls the birth as a very complicated one in which her uterus failed to contract almost making her lose her life. 2. Gabby and her husband are hard nuts when it comes to parenting. Judging from the circumstances surrounding the birth of their twins’ one might expect them to pamper their kids but the reverse is the case. Although they love their children, they make sure they are hard fisted when it comes to handling issues relating to their kids. In an interview last year Gabby revealed that their kids don’t use phones. 3. The beautiful couple sure knows how to bust some moves when the need arises. They were participants on the 5th season of the BBC created celebrity dance show – Strictly Come Dancing. While Gabby was partnered with James Jordan, Kenny was partnered with the beautiful Ola. At the end of the competition, Gabby was placed 12th while her husband Kenny placed 6th. 4. They are both past presidents of the Child Charity Organization Sparks which helps in raising funds to sponsor medical research into the cure for several children diseases. Gabby is also a member of several other charitable organizations such as The Princes Trust, and The Disability Trust. Her love for charity came as a result of the death of her brother Daniel from hypertrophic cardiomyopathy at the age of 15. 5. From childhood, both Gabby and Kenny have been adherent lovers of football. Logan is a supporter of Scottish league outfit Rangers FC while Gabby is a staunch Newcastle United. According to her, the greatest game she has ever seen is the 5-0 mauling of Manchester United by Newcastle United on the 20th of October 1996.